We planned a spur-of-the-moment trip to Gatlinburg this past weekend. On Saturday afternoon, Mom drove down from Indiana, and we all headed to Gatlinburg in our Jeep Grand Cherokee on Sunday morning. Just our luck… it started raining the second we got our tents put up! So we drove to the hub of Gatlinburg and had dinner & walked in the rain a bit, but most of the shops were closed. Monday morning, we took a quick drive through Cades Cove and spotted lots of deer (like usual), and even a black bear (like NOT usual)! I had just finished informing mom that Park Rangers once told us to look for bears high in the trees – making their beds, when lo and behold… I thought I spotted a bear up in them thar trees! Soon, there were a couple dozen people with cameras standing around taking pictures of the mama bear and her 3 baby cubs. They paid us no mind, and I was surprised by just how close we were able to get. But even from our vantage point, you could see the HUGE razor-sharp claws on that bear! Mama bear was biting off thick tree branches up high in the tree with her bare teeth, and forming a cushy bed with them. She even jumped from one tree to another, and the babies played rambunctiously way up high in the tree tops. Then on a completely different road, on our way home, mom spotted another black bear up in the trees! Only this one escaped before we could pull the car over to take pictures. 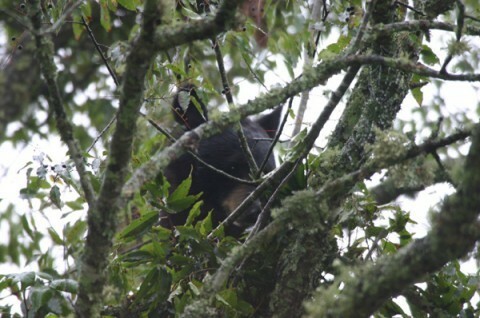 Black Bears aren’t so frightening… at least when they’re way up in the trees!